This is basically just what I have so far. I will post the chapters as I complete them. This is the completed Prologue. Long ago, back when this ancient planet was young, long before the first civilization. Before the first mammal organisms became the dominant species of any ecosystem. It was the time of the dinosaurs. Now, the dinosaurs were of many kinds. Some had long necks and could reach the highest leaves of the trees, and some could reach the top leaves by their strength. Others could swim, while others flew through the skies. And some craved meat. They fed upon the leaf-eating dinosaurs. It was an eternal fight for survival between the two different kinds, most of the time ending in the deaths of one side or the other. While the meat-eaters thought themselves dominant, that was far from the truth. Dinosaurs were, by fact, ruled by the leaf, and when the land starting dying out, so did they. The once green, lush world was becoming a wasteland north, south, east and west. There were some rumors, however, about a distant, called, The Great valley. But it was only rumor. Some dinosaurs, however, were desperate enough to leave the place where they had lived for the longest time, and struck towards the west. Searching for this “Great Valley”. It was rumored that this place was still lush and green. Where some believed it was a journey towards, others were very doubtful. It would be a big decision to go to such a place, especially when it such a long ways away and they’d face dangers far worse than anything they might come across in their homeland. There were scoffers and believers and endless debates about whether it should be chanced going to find this ëGreat Valley’. One such debate was being made in a place called, the Green Meadow. Which was now anything BUT green. One of the herds of leaf-eaters, Longnecks, to be exact, had gathered together to decide the fate of herd. To stay and squeeze out a survival on the ruined remains of a once great valley, or to toughen up and go try to find the now Great Valley. It was a herd torn in two. Thunderstride, the elder and former leader of the herd was in favor of going to The Great Valley and he had many followers. But Strongtail, the current herd leader was not so optimistic, and he also had many supporters. “It’s a fool’s dream!” Strongtail, the Herd leader scoffed. “Don’t you DARE talk to my father that way!” Thunderclap: Thunderstride’s daughter, said incredulously. “You have no right to speak to him in such a manner. He’s our elder.” Another added in. “My apologies.” Strongtail said, through gritted teeth. “I should hope so.” Thunderclap said. “Oh, please…” Strongtail said, knowing that the elder and his daughter were going to use her pregnancy in this debate sooner or later. “My daughter is right. These raids cost us Bron, who was lost to those horrid creatures. Its because of these raids that my Grandchild will not have a father.” Thunderstride said, insistently, “Is that what you want for the rest of the herd.” Thunderstride added, gesturing to the other longnecks. Strongtail was at a loss. He knew that he was now losing. “That is my decision.” Strongtail ordered, “Anyone who dares to go to this “Great Valley” will leave TOMORROW! If you decide to come back, you’re more than welcome to.” And with that, he turned and left. “Although, we could talk more in the morning.” Strongtail said over his shoulder. With that, the council had ended and the herd went to lay down to sleep for the night. “This will be a march of man dangers, Thunderstride.” Grayvale: Thunderstride’s mate, said. “I doubt it. I only wish someone could dethrone him from his pedestal.” Grayvale said. “You mean like making two pregnant members of herd leave by sunrise?” Thunderclap asked, gesturing to Softfoot, who was following along behind. Thunderstride, Grayvale, and Thunderclap did not respond. It was a reasonable choice, but Thunderclap was not going to do the same as her friend. Thanks. I hope some others, other than you and Malte will comment, too. 1.) The first section before the dinos start talking reminds me way too much of the prologue they gave in the original LBT film. It's almost copied word for word...I'd revise that. 2.) You've got two characters with very similar names: Thunderstride and Thunderclap...consider changing one of those names because already I'm getting confused as to who's who with names that are so similar. Other than that, this sounds fine. Interesting! It sounds like there is going to be an explanation for Bron's absence which I may find more satisfying than the one given in LBT 10. As you mean to create a remake of LBT which is slightly altered, I don't even think it would be a flaw to keep up some of the litteral words from the original movie (e.g. in case of dialogues between Littlefoot and his family). It is interesting to hear about the way this longneck herd is organized. Leader and eldest who seem to be in sort of a conflict, though the later was involved in appointing the first. On the other hand the longnecks seem to have the choice whether they want to do as they are told to (which means staying with the herd) or not (which would mean going their own ways). This structure may work out very well for longnecks. I don't know how much you've written so far, but I'd like to draw your attention to the fact that in LBT 1 we see Littlefoot's mother had several eggs, all of which except for Littlefoot's were smashed. Maybe this could become an interesting story-element. You mentioned you're going to "remake" Spike. Does that mean you are going to let him talk? Maybe there are other ways to involve him more, but I don't want to talk into your concept too much. Maybe it would be interesting (but it might as well make the story long-winded, which is a frequent problem in my stories) to know a bit about the outward appearance of the characters. Are they all the same kind of longneck? Scientific terms however would sound strange in a land before time story, but maybe it is possible to create dinosaur names for different kinds of longnecks. For example "Crest head" for a Brachiosaurus, or "Square head / jaw", or "whip tail" for a kind that sports this features. Just a suggestion though, no criticism. To Malte: I'm not sure what I'm going to do with Spik'e character yet. 'm currently writing the 'Chapter One'. (This was the prologue.) Actually, what you read is the explanation of Bron's fate. While I have no problem with him, personally, I think there were other options for LBT10's plot. Plus, this is what, in my mind, had been what happened to Littlefoot's father. He was killed. Until LBT10, that's what I always thought. To Arvens: The reason I named Littlefoot's mother "Thunderclap" in this one is because I'm trying to establish a bit of culture, because these dinos do talk. I decided the children would have a name similar to the father's name, or perhaps similar to a nickname the father went by. You may have similar names but like I said, I'm already getting confused. It was just a suggestion to revise it as I'm sure I'm not the only one who's getting lost. Oh, I have revised it a bit. You'll be les confused with the first chapter. I guarantee it. Author’s Note: I will refer the elder Thunderstride as “Elder Thunderstride” and I will still only refer to his daughter, Thunderclap, as Thunderclap, from here on in to avoid confusion. Elder Thunderstride was not pleased. Only a few had come this morning. Grayvale, Thunderclap, Brook, Bron’s brother, Embassy, Brook’s mate, and Alizerin, the only unmated, mature female of the herd, had arrived. The group only nodded at his words. The group nodded to him in response. “Come,” Elder Thunderstride said, “We have a long journey ahead of us.” He started towards the exit to the valley. It was a narrow tunnel that could only be passed through in single file, and it led to a large thicket of trees that hid it from view, most of the time. The five exited the once green valley and looked around. No sharpteeth were about, but there was noise. “Look.” Grayvale said, “Other herds.” Sure enough, in the distance to the left of them, there were many herds of many kids. Flyers, threehorns, spkietails, swimmers, and such all traveled, though separately, towards the west. “Very well.” Thunderstride replied, and started in the direction of the other herds. “We will travel with them for a time, anyway. At least until we are out of this sharptooth territory.” Elder Thunderstride said over his shoulder to his followers. “Oh, please, try to make it sound harder.” Alizerin said, feeling grumpy now. For several days, the herds traveled sort of together in a mutual direction, until each took its own route at several webbed crossroads that came along. Alizerin had, long before this, had decided to go home and left the group. They bid her farwell and hoped that she made it back alive. Brook, Embassy, and Thunderclap showed no signs of despairing like Alizerin had. They had come across many dangers on their journey: Sharteeth, par-pits, rocky and steep land, and hunger. As most of the herds did, but not a single one ever gave up their search, as it was their only chance. They hardly ever stopped during their journey. The only time they EVER stopped was to hatch their young. There are some relatives of Bron. It would be interesting to know what happened to them, as it seems like none of them reached the Great Valley. Or... hm... Littlefoot's grandparents are matternal, aren't they? Bron called Littlefoot's grandpa "Papa longneck" which sounds familiarily, but not like a son addressing his father. One thing I noticed is that herds of all kind are moving together. Though this may provide some security of sharpteeth (especially for smaller kinds than longnecks) it is even more likely to cause conflict and competition over the sparse green food in the lands they cross. Such a conflict is likely to happen. 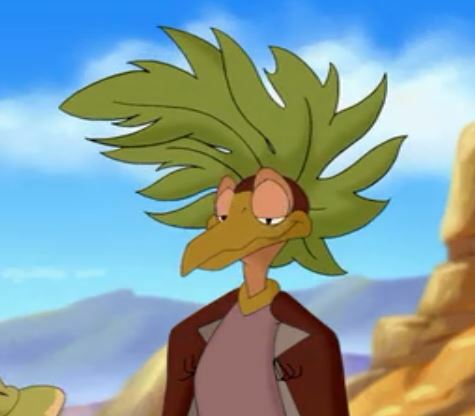 Don't forgett that even Littlefoot's mother stated that the differen't kinds never do anything together, though she didn't come across as a great racist. Well, in my mind, the herds that group of five longnecks come across were just a bunch of herds who happened to be going in the same direction and they were all using the same spot to cross at the moment. Would it be illegal to do this? I'm naming the second chapter "The Birth of the Gang of Five". Looks like you're doing fine to me, WR. Just watch your spelling of "farewell" in future chapters. Why would it be illegal to name the chapter the birth of the Gang of Five? :unsure: I have no rights to the name...nobody does...there are many "Gang of Five"'s out there. Are there? I always thought it was a reference to the five maincharacters of LBT. I was just making sure all was well with that title before I posted it. Very interesting, they should really do something like this...a prequal, couldn't seem them making it though as it'd lack the main gang. I'd personally love it if they did though. I love the character depth you've added to the Littlefoot's mother and grandparents, and I think they have cool names.^^ Poor Alizerin...what a scary and lonely walk back she must've had. I could almost see some scenes playing out in my mind, great work...and now I'm off to read the next part. The Land Before Time - "Dawn"